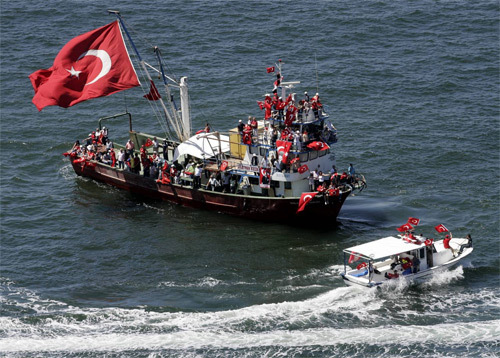 Demonstrators wave Turkish flags on boats during a pro-secular rally in Izmir, western Turkey, Sunday, May 13, 2007. Hundreds of thousands of secular Turks demonstrated on the seafront of Turkey's third-largest city, fearful that the Islamic-rooted government is conspiring to impose religious values on society. The rally, a show of strength ahead of general elections on July 22, follows similar demonstrations in Ankara and Istanbul last month. The huge turnouts were staged to pressure Prime Minister Recep Tayyip Erdogan's government, which nominated a presidential candidate deemed by the secular establishment to be Islamist.